But those compromises don’t mean that gaming on a notebook isn’t a worthwhile pursuit. Far from it – after all, it’s the only way you can enjoy a blast of PC gaming while you’re out and about, maybe on a long and deadly dull train journey. And there are definitely ways of making your laptop gaming experience a better one, which is exactly what we’re going to look at in these tips. It pays to pick games with lesser spec requirements, as obviously enough, these will run far more slickly on a notebook (particularly a cheaper or lower-end laptop). That means games with undemanding graphics, or perhaps older titles. This doesn’t mean you have to play rubbish games, as there are some great contemporary indie efforts which aren’t CPU or GPU-intensive – think Cuphead (pictured above) or Thimbleweed Park – and some classics which are still, er, classics. In the latter case, you could try something slightly older like The Sims 4 (which actually has a ‘laptop’ mode for smoother running). Check out our feature which lists a load of resource-light games. For best performance, particularly with more demanding games, it’s a good idea to turn down the screen resolution. After all, it’s better to have a smooth moving shooter where you can actually aim and hit the bad guys, than a gorgeous looking slideshow in which you’re stuttering and jerking around the level, with no hope of hitting a barn door. Drop the display resolution down as much as you can go without getting silly, accounting for your own personal tolerance for lower quality graphics. Equally, visit the in-game menu to turn down detail levels, and be sure to get rid of fancy effects like anti-aliasing, detailed shadows, water ripple effects and so forth. Over time, your laptop – or indeed any PC – slowly accumulates more and more detritus which makes it more sluggish, as you install more games and software. You can clean house, and make your Windows notebook run a bit faster, by firing up Disk Cleanup (simply type that into the Cortana/search bar, next to the Start button on Windows 10, and click on the icon to start it). Alternatively you may prefer to use a free utility like CCleaner or similar; we’ve got you covered with options on that front. Also ensure that you aren’t using any other apps or services you don’t need when playing a game, as they will eat resources the game could otherwise use. Close all running apps, and you can also look at the Task Manager (press Ctrl-Alt-Delete together, then click on Task Manager) to see which apps are using the most CPU, memory and disk space. It’s also possible to close background processes, but be careful not to shut down anything critical to the operation of Windows (if you aren’t sure of what something does, leave well alone). 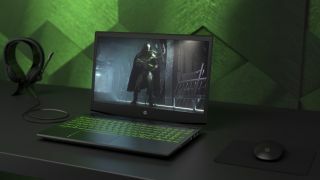 Finally, as ever, it’s also a good idea to make sure the drivers for your notebook’s hardware are all up-to-date, particularly the graphics drivers – that’s really crucial and can make a big difference to the performance of some games – if you have a discrete GPU (i.e. not integrated into the processor). Rather than trying to get by playing games on the keyboard, or indeed with the keyboard and a portable mouse – which can be difficult when space is at a premium, say, on a cramped train table – invest in a console gamepad (or just use your existing one if you already own a console). Many games play really well with a gamepad, once you’re acclimatized; and some are even best with a pad. Microsoft’s Xbox One controller is, unsurprisingly, fully natively supported in Windows and the best choice in that respect, although the PS4 controller works just fine as well. As well as taxing your components, games can also sap your battery, and when you run out of juice, it is, of course, game over. One easy way to help conserve power is to lower the screen brightness, at least as much as you can while still having a palatable gaming experience. On a related note, make sure your power plan (Control Panel > Hardware and Sound > Power Options) is set to balanced and not high performance, as the gains the latter makes aren’t worth it in terms of the added battery drain. Also don’t forget you can buy portable battery chargers for notebooks to give you additional longevity while on the move.